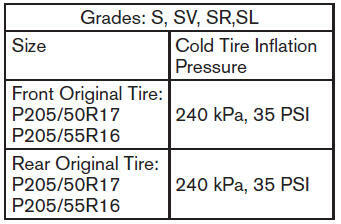 This vehicle is equipped with the Tire Pressure Monitoring System (TPMS). It monitors tire pressure of all tires except the spare. When the low tire pressure warning light is lit and the CHECK TIRE PRES warning is displayed in the odometer, one or more of your tires is significantly under-inflated. 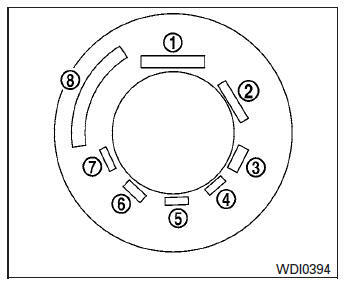 For more details, refer to “Low tire pressure warning light” in the “Instruments and controls” section, “Tire Pressure Monitoring System (TPMS)” in the “Starting and driving” section, and “Flat tire” in the “In case of emergency” section. The “TPMS with Easy Fill Tire Alert” provides visual and audible signals outside the vehicle for inflating tires to the recommended COLD tire pressure. 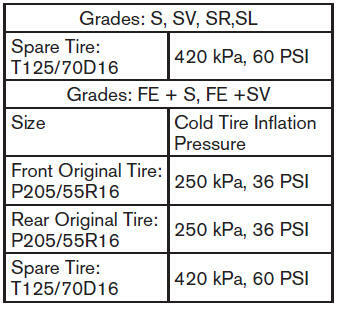 For more information, see “TPMS with Easy Fill Tire Alert” in the “Starting and driving” section. Vehicle load limit: See “Vehicle loading information” in the “Technical and consumer information” section.